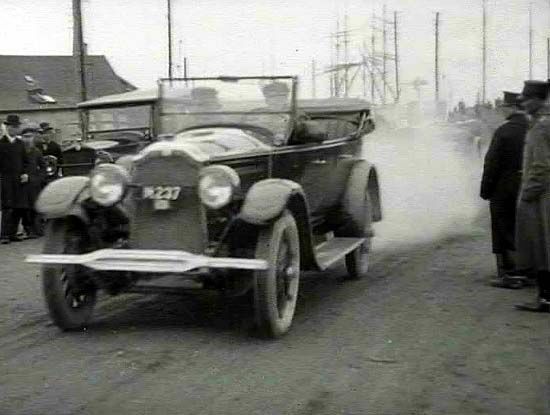 IMCDb.org: 1924 Buick Model 24-49 [24-49] in "Mitt hjärtas Malmö, 2005-2019"
I just updated the episode index, this film was made 1924. In spring as it seems. This car has temporary plates or dealerplates, can´t tell which, so it would be new. Could it at least be a 1923 model? 1922 would probably be a little old at the time for an unsold vehicle. An update on this one - this car has front wheel brakes so has to be a Second Series from 1924. It could be either a 226 or a 233 7 passenger. An update on this one. It has been pointed out that it is not a Packard but is a Buick. The clues are; the headlight tiebar is in the middle of the lights (the Packard tiebar is at the bottom), the Packard does have cowl lights and there is a square Buick badge on the radiator. Dealer license plate M237. M = Malmöhus län. The small square under the two and three is a yellow badge that reads 'AH' for automobilhandlare (car dealer).